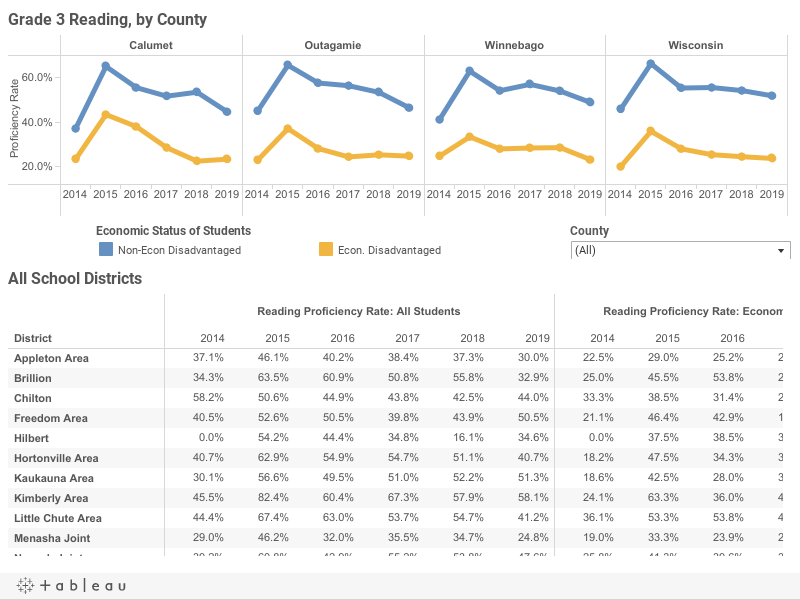 This page includes data from the Wisconsin Department of Public Instruction on Grade 3 Reading proficiency. The Grade 3 Reading proficiency rate is the percentage of all Grade 3 public school students rated as proficient or advanced in grade-level reading based on the annual Wisconsin Knowledge and Concepts Examination. The Grade 3 Reading performance gap is the percentage point difference between the Grade 3 Reading proficiency rates of the economically disadvantaged and non-economically disadvantaged Grade 3 public school students. Economic disadvantage is based on income eligibility for free or reduced-price lunch. Economically disadvantaged students tend to perform at much lower proficiency rates than non-economically disadvantaged students. A performance gap of less than 0.0% means that the proficiency rate for economically disadvantaged students was higher than for non-economically disadvantaged students. County-level data are aggregated from data at the school district level based on the county assigned to each district by the National Center for Education Statistics. The total number of students is very small in some districts, meaning a large variation in reading proficiency rates can be expected to occur from year to year. It is also important to note that the inclusion of recent years’ reading proficiency data incorporates different versions of the state test – WKCE (2013-2014), Badger (2015), and Forward (2016-2018)*. Since proficiency tests changed over the years, outcomes across years may not be directly comparable. The data show a jump in proficiency rates from 2014 to 2015 that coincides with the introduction of the Badger Exam. The Wisconsin Department of Public Instruction (DPI) notes that comparisons between Badger and WKCE results are not possible because of significant differences between the two tests.